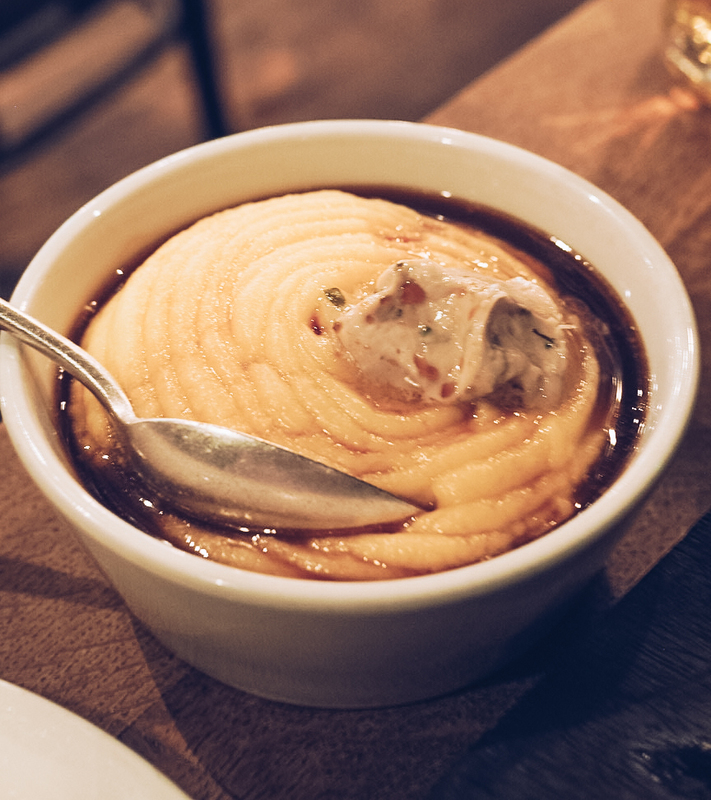 Looking for comfort food with a sophisticated twist? 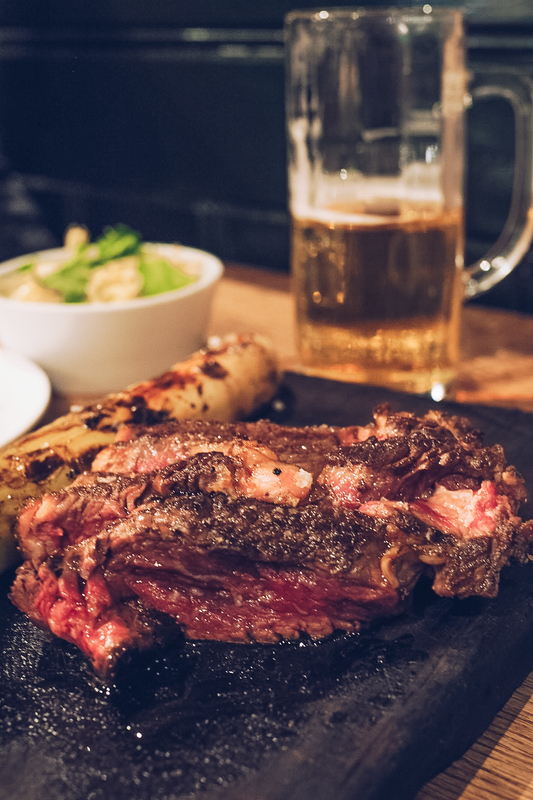 Pitt Cue has graduated from its first location in Soho as it serves up barbecue to impress in its new Central London restaurant. 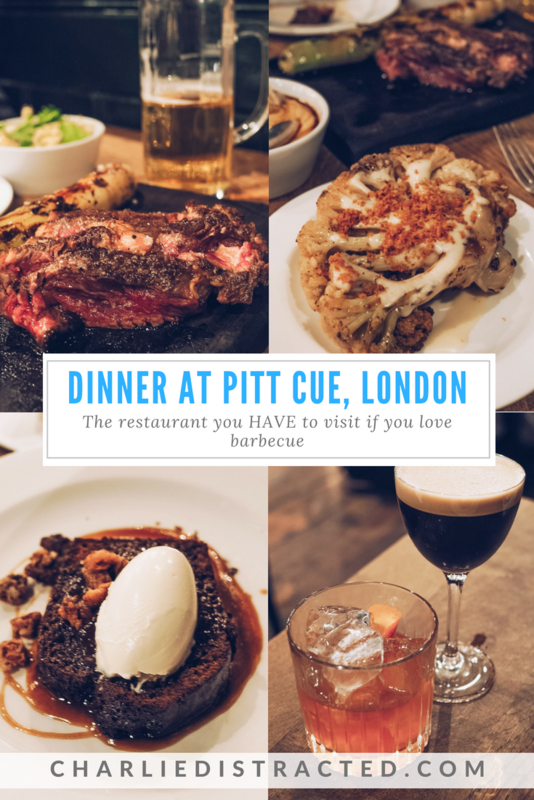 Pitt Cue is one of the first London restaurants I fell in love with. 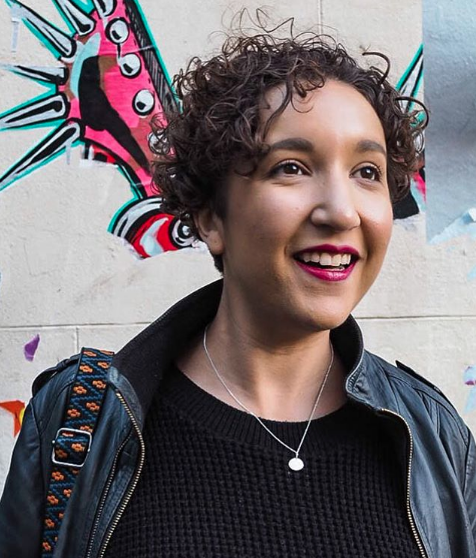 Years before I spent my money on travel, I would take days off work to get to know my new home city, and during one of these jaunts, I stumbled across the original Pitt Cue Co (as it was then known) site, on the corner of Ganton and Newburgh Streets. 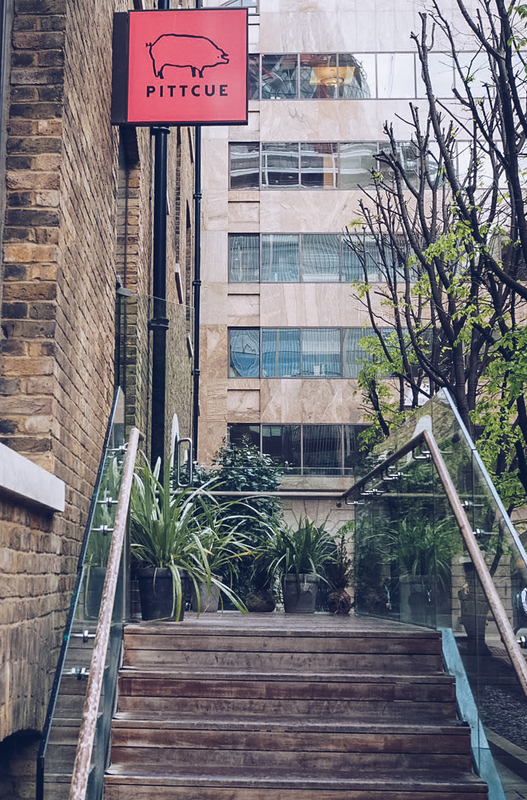 Its tiny, squeeze-in-or-queue-outside location could fit 10 times into their current premises, standing proudly on the edge of Devonshire Square, and I wasn’t sure if this upgrade would mean a big change to the menu I’d previously fallen in love with. The emphasis, as the name suggests, is on barbecue, and this homely style of cooking always lends itself to an aesthetic that feels a bit tougher. Where the previous outpost used to serve food up in enamel trays, I now found myself in a room reminiscent of a members club attended exclusively by people from America’s Deep South. Leather, wood and steel made the room feel more intimate, whilst wallpaper with cow’s udders on kept a light-hearted charm. 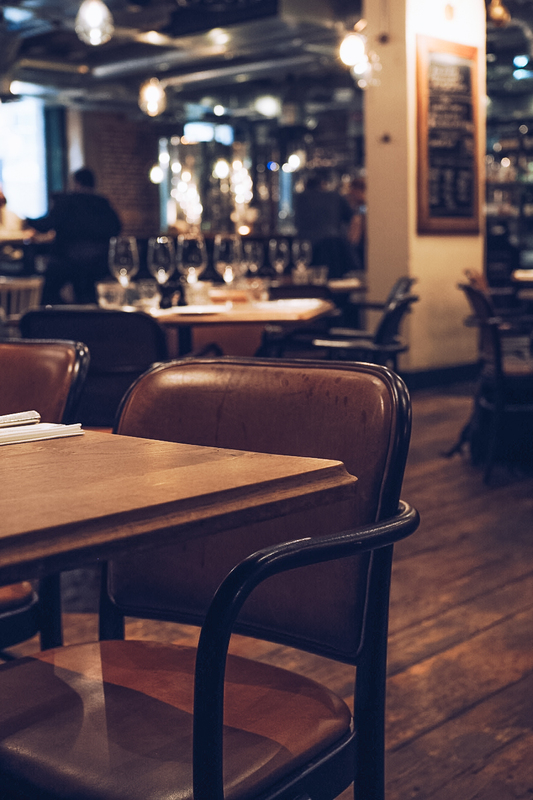 As expected, the menu has changed but only in so much that it’s much more refined; this may be barbecue, but Pitt Cue has worked hard to shrug off any comparisons to faux-Americana chains such as Bodeans or The Diner. The starters were the perfect example of this, using cuts and ingredients that only an independent restaurant could produce confidently. 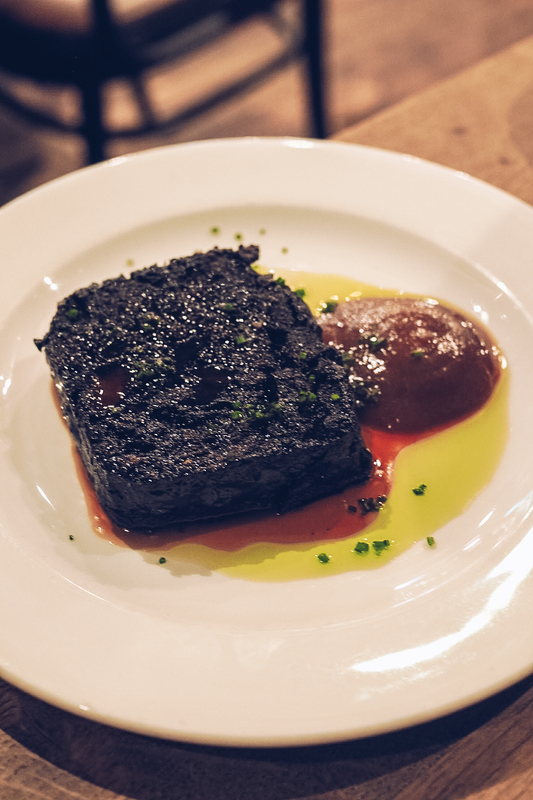 The blood cake was a tangy, rich slab of black pudding which could have been cut with a butter knife, it was that delicate. 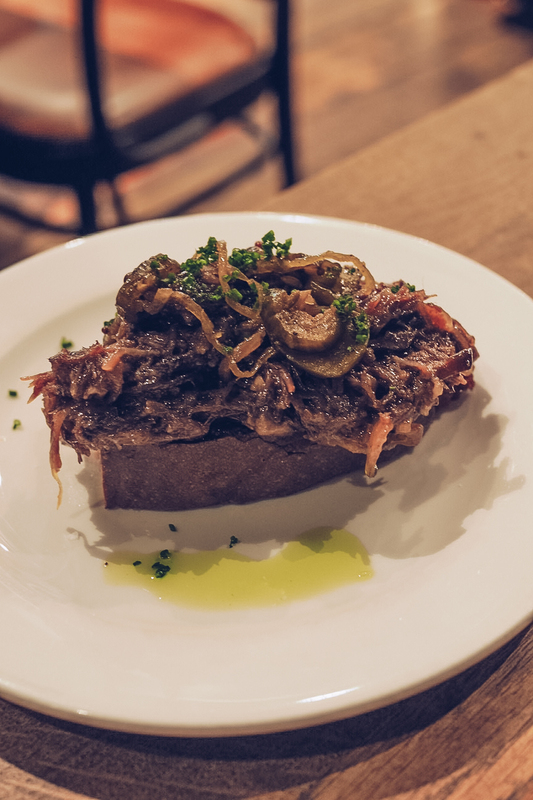 The simple smoked beef on toast was the closest thing to the ‘pulled’ meat we all associate with barbecue joints, but smoking it meant it didn’t need lashing of bbq sauce to give it flavour. See what else I’ve been eating on my Food Instagram Stories highlight! 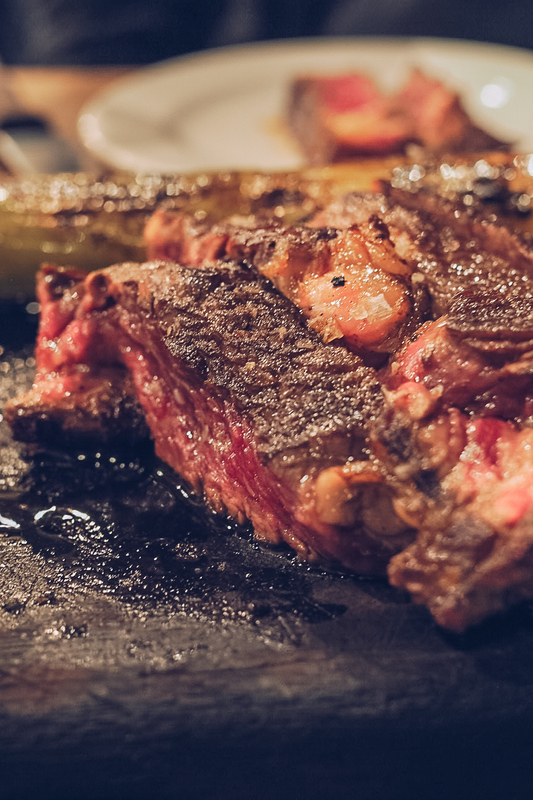 There’s a huge range of meats served in various cuts, and although I was tempted by the Mangelitza pork (a meat I tried in a salami form in Hungary – it’s country of origin), we went for a rump to share. We asked for it medium-rare, the way our incredibly attentive waitress recommended, but it was definitely much more on the rare side. It was a beautiful cut, if a little fatty, but being slightly pinker than I would’ve liked, it wasn’t really the highlight for me. To be honest, the meat was pretty much just a conduit for me to shovel more side dishes into my face. Each one was absolutely sublime, from my old favourite Pitt Cue Co dish of creamy mashed potato with bone marrow (the most obnoxious way to ingest my ultimate comfort food), to a tart green chilli slaw which freshened up the meal perfectly when I came dangerously close to getting the meat sweats. The best side dish, and something I could easily eat as a main, was the cauliflower and cheddar. 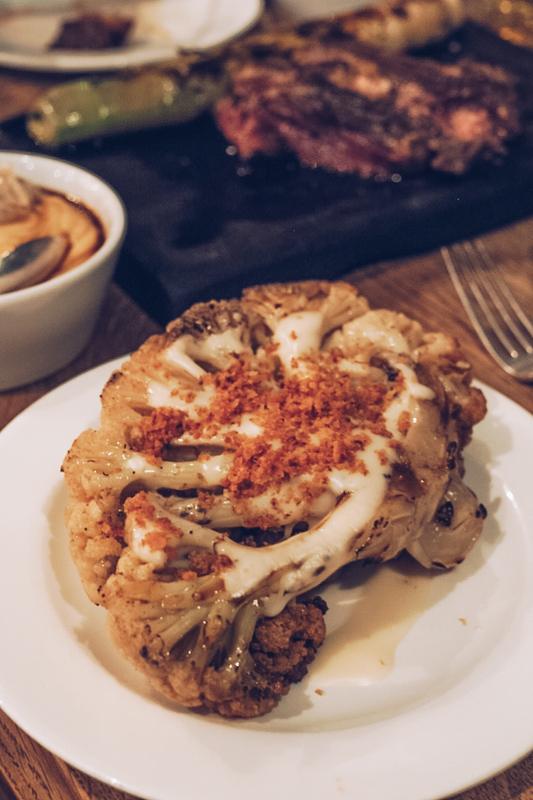 Roasted and smoked, the cheese melted deep into the crevices of the cauliflower which meant every mouthful was a gamble as to how much cheddar you’d luck out with (spoiler alert: I wasn’t disappointed at any bite!). Although we were reaching the uncomfortably full stage, the decadence of the evening took over and it seemed a shame to miss out on dessert and a cocktail to round the night off. 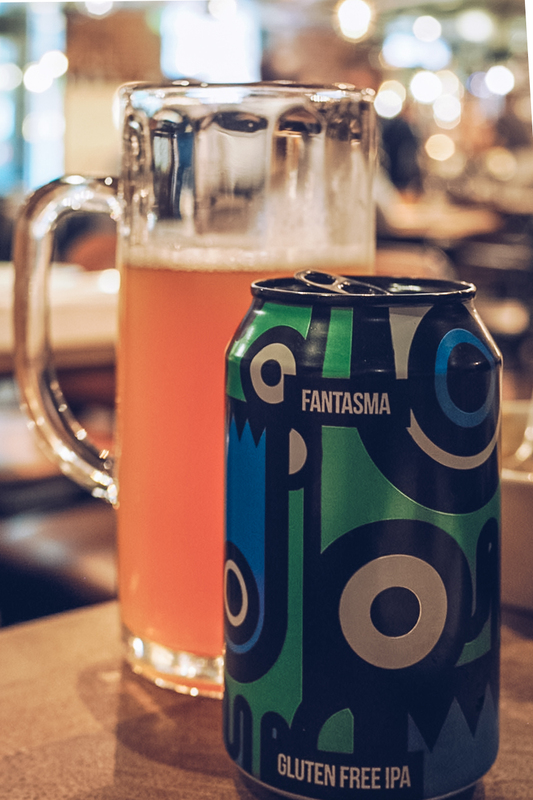 We’d already tried a couple of great beers from the hefty drinks menu, some brewed on site and a couple of imports including an excellent gluten-free IPA which made me feel much less bloated than a standard ale. 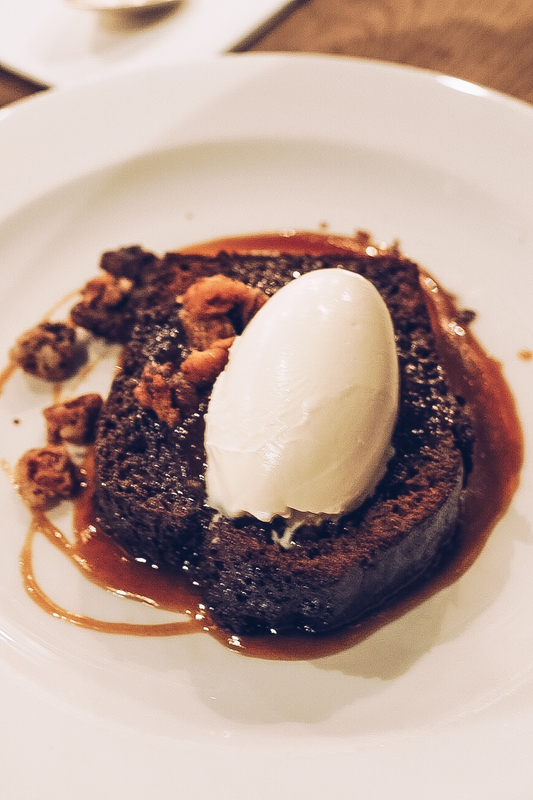 But with a rich dessert like sticky toffee pudding, we both went for something that would help us digest a little better. 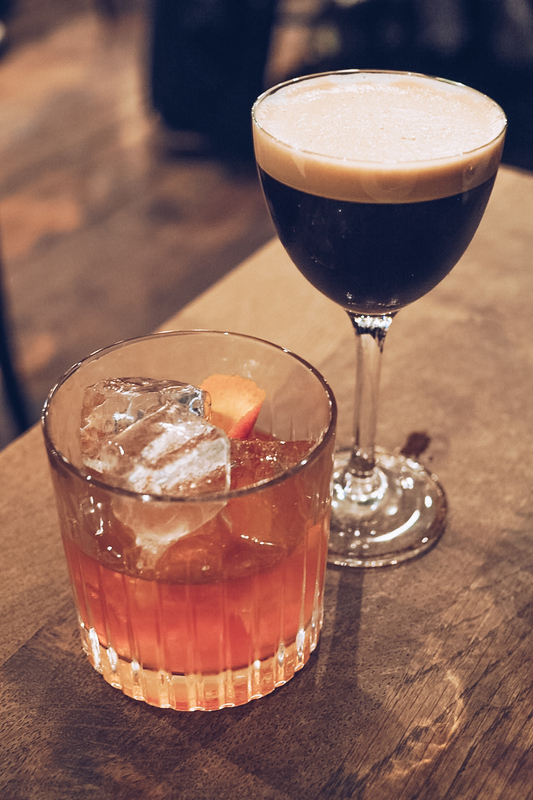 The head barman recommended an amazing fruity rye bourbon for my boyfriend’s Old Fashioned, and whipped me up an espresso cocktail to give me enough energy to make it home after an incredibly indulgent and thoughtfully put together meal.